This is Cindy’s Cleopatra’s Fan quilt and when I was searching online for quilting ideas I found it as a kit on the Craftsy website here. It was the only quilt I found for inspiration and Cindy said she felt it was quilted to heavy to her taste so I kept my quilting designs on the lighter side. I had never seen this pattern before so was very excited to quilt this one as the blocks have a very unique shape to them. This metallic fabric collection is by Robert Kaufman and called Beau Monde. I quilted all the blocks the same with Magnifico #2063 gold thread that matched the gold in the fabrics. Since the block have two fabrics and the light and dark alternate you can either see the leaf swirl design or the feather designs. I then quilted simple swirls in the background with white So Fine thread. I used Quilters Dream Blend batting and a light beige So Fine thread on the back. Now I’ll have to pack up this beauty and sent it back to Cindy in California! I, too, have never seen this block before. It is intriguing with its shape and colouration. I really like how the quilting shows differently on the differently coloured blocks. This is a real showpiece. Congratulations, Cindy and Kathy. Kathy, I think you have your quilting mojo back. 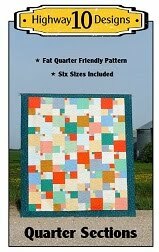 Beautiful quilt...........I usually don't like "rounded" blocks --- but these are stunning!! So pretty. I think your quilting looks lovely. You really made them pop. Fantastic, beautiful quilting. You amaze me! 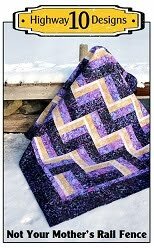 I love this quilt, and your quilting just made it even more beautiful. Thanks for sharing the pictures. Such an unusual quilt, but ever so pretty. Your lovely quilting tops it off nicely! I don't think you ever lost that mojo!!!! Lol.....I simply love this pattern....I have to check it out. I adore the quilting you did on it!!! What a wonderful quilt! 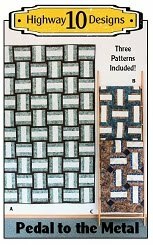 Not only is the pattern different from any I've seen but the fabric choices are perfect. 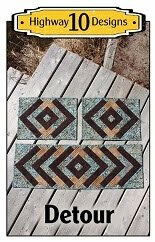 Your quilting is the perfect accent to bring it to life. P.S. 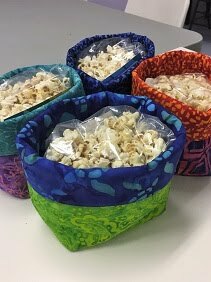 I found the free pattern on the Robert Kaufman site. THAT is an interesting block! And your quilting is perfect for it. 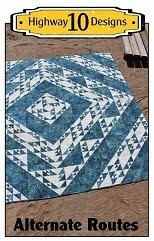 Your quilting on this beautiful quilt is just so perfect! That's the perfect quilting for this! Sorry I have no idea as I didn't piece the top, my client did, I just quilted it for her.